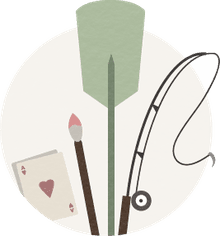 There is a collectible that fits all those guides lines and something I've been sort of collecting unconsciously for years -- advertising tins. If you are drawn to advertising and colorful graphics, modern tins just might be the collectible for you. 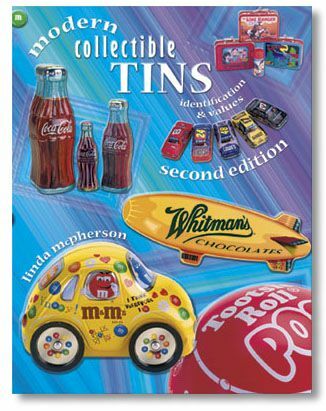 McPherson's Modern Collectible Tins book is a great way to get started. I'll bet there are dozens of tins pictured that you didn't even know existed and would be a perfect addition to your collection. And now that you know they exist -- your job is to find them! Linda McPherson's second edition is a fun book that will have you smiling as you leaf through the various chapters. As the title denotes, these are modern tins with the majority from the 80s and 90s, although there are a few older ones are pictured. Antique tins can cost hundreds of dollars, but these tins are very affordable -- most prices are well under $10. each. McPherson has suggestions on where to find your tins, as well as ideas for displays. For instance, she suggests decorating a shelf in the kitchen with a brand name product or using a collection of miniature lunch boxes in a child's room. And I've known of teachers who use the Crayola tins to decorate their classrooms. Modern Collectible Tins is mostly pictorial, with each tin pictured showing the name of the product, size, and estimated values. The one thing I would have liked to seen is how the tin was released. Was it a mail order premium, sold at a retail store or sold with product inside? Of course when you find large numbers of tins at secondary markets it would be difficult to find that information and from my personal experience, many companies just don't keep good records on things like that! There were a few chapters that were particularly enjoyable -- Crayola & Watercolors, Roly-Poly Characters and the Recipe Boxes. Other chapters include: Banks; Buildings & Houses; Candy & Gum; Cereals; Coffee, Tea, and other Beverages; Cookies; Crackers; Fossil Watches; Mini Lunchboxes; Miscellaneous Foods; Pet Products; Popcorn, Peanuts, Cracker Jacks and other Snacks; This 'N That; and Transportation. I'll bet you're already a tin collector, but just might not realize it until you've browsed through this book and start recognizing them. Next you'll be looking around the house and soon be discovering all sorts of tin treasures!